Home » Outdoor activities that locals and visitors love about the Northern Black Hills! Living in the Black Hills offers its residents and vacationers the opportunity to witness God’s handy work in a most special way. The warmer weather we experience in the spring, summer and fall may be a little more comfortable temperature wise, but there is no denying the beauty that comes with winter in the Black Hills! 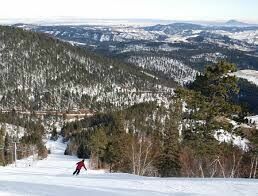 In the northern Black Hills…where SKIING brings friends and families together, you will find Terry Peak Ski Area. Just outside of Lead, SD. where the elevations range from 5,900 to over 7,000 feet. More snow can fall in this area than any other in the Black Hills. Whether you are a fan of downhill skiing or cross country skiing the trails are groomed to perfection making it ideal for the beginner or the expert! Come join the fun…from skiing and snowboarding to tubing or just relaxing in the lodge watching the outdoor enthusiasts! A little lower in elevation and to the west of Lead you will find one of the most beautiful and most visited canyons in the United States…Spearfish Canyon, just a few short miles from Spearfish, SD. No matter the time of year its beauty is hard to beat, but with winter the Canyon takes on a whole new appearance. The tall spruce trees covered in snow, the bare leafed aspen and the frozen iced waterfalls are breath taking. HIKING the short trail from Spearfish Canyon Lodge to Roughlock Falls is most invigorating and a genuinely gorgeous outing. Grab the skis at the Lodge perfect for cross country and have yourself a great time! If a little faster pace on a machine doing the work for you is more your cup of hot chocolate, then SNOWMOBILING is the way to go! Groomed snowmobile trails line the backcountry of the northern Black Hills. 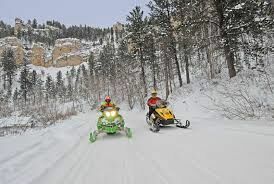 You will find snowmobile rentals in Deadwood, Lead, Spearfish Canyon and Trailhead Lodge just west of Lead. 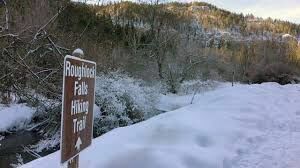 The welcoming trails of the high country are perfect for the casual days ride but remember you may need to move over a little, just in case that snowmobiler who enjoys the sound and feel of speed comes upon you! It’s waiting for you…go explore, go have fun and take a moment to thank God for the beauty he surrounds us with. Please browse our website for Rapid City homes for sale or land for sale anywhere throughout the Black Hills, when you find it call me Ida Walter, 605-390-1509, I would love to assist you!